A new Brazilian study was recently released entitled: "Mortality by neoplasia and cellular telephone base stations in the Belo Horizonte municipality, Minas Gerais state, Brazil" by Dode et al, Science of the Total Environment 409 (2011) 3469 - 3665. This paper examined mortality rates cancer in the vicinity of cellular telephone base stations. The study concludes that the risk of death from cancer increases in close proximity to these base stations. This finding has been seized upon by a number of alarmist groups who are using it to question the safety of wireless technology. See our comprehensive critique of this study. The following are some examples of the kind of poor quality studies that have helped fuel the concern of alarmists. We have chosen these particular studies because they were highlighted in Radio-Canada program Découverte last year. See our web page dedicated to this program. The following quote from the WHO Fact Sheet on base stations and wireless technologies is important: "Media or anecdotal reports of cancer clusters around mobile phone base stations have heightened public concern. It should be noted that geographically, cancers are unevenly distributed among any population. Given the widespread presence of base stations in the environment, it is expected that possible cancer clusters will occur near base stations merely by chance. Moreover, the reported cancers in these clusters are often a collection of different types of cancer with no common characteristics and hence unlikely to have a common cause." 1. Israeli Study entitled "Increased Incidence of Cancer near a Cell Phone Transmission Station" was one of two alarmist studies on the Radio Canada program Découverte last year. This is a study done in Israel on the incidence of cancer near a cell tower in the town of Netanya. This study was published in 2004, but examined cancer data only for the period from July 97 to June 98, which was only one year after the cell tower entered service in July 96. The study concludes that the risks of developing cancer near the tower were 4.15X higher than the control based on a total of only 8 cancer cases, which in this context is not statistically relevant. A variety of cancers are implicated. There was no follow up for subsequent years. If the cancer rate was so high for this one single year, why didn't they publish the data for subsequent years? It is preposterous to suggest that this cell tower caused these cancers only one year after entering service when the gestation period for most cancers is at least several years. This study is a clear example of cherry picking of data. 2. German study entitled "The Influence of Being Physically Near to a Cell Phone Transmission Mast on the Incidence of Cancer" was the second of two alarmist studies on the Radio Canada program Découverte last year. As the WHO Fact Sheet on base stations and wireless technologies states: "Over 1.4 million base stations exist worldwide and the number is increasing significantly with the introduction of third generation technology.....Given the widespread presence of base stations in the environment, it is expected that possible cancer clusters will occur near base stations merely by chance." Apart from cherry picking a single base station, this German study contains the following anomaly. 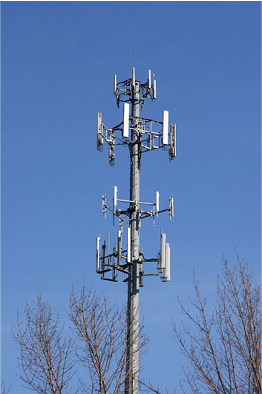 The study states that the average age for developing cancer in the "dangerous" inner zone near the cell tower is 64.1 years, and it is 72.6 years in the outer zone, at a safe distance from the tower. However, the study also mentions that the average age for developing cancer is 66.5 years for Germany as a whole (see P 4 of the study) . So the average age of developing cancer in the "dangerous" inner zone is very close to the German average. This difference is not statistically significant. Both the above Israeli and German studies are contradicted by much more robust and comprehensive studies such as the Moulder et al. study and the SCENIHR report described on our cell tower page.